In Big 12 action, Saturday was all about the home teams. 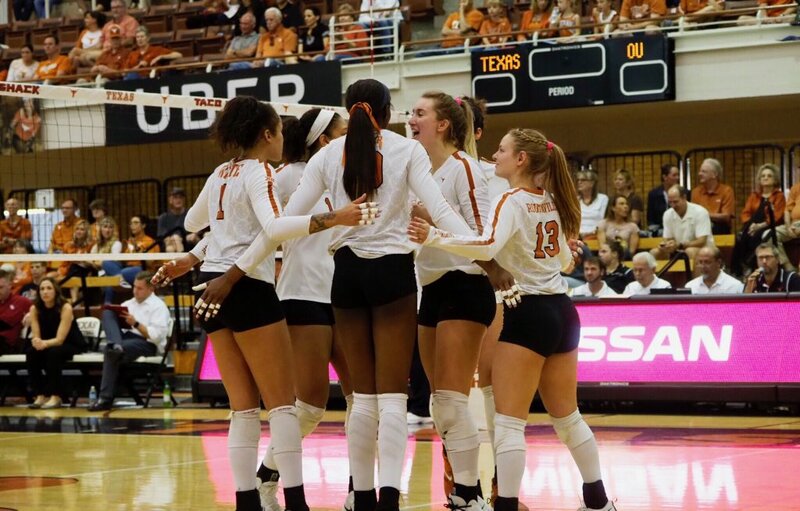 In Austin, #9 Texas swept Oklahoma while Baylor was impressive in a sweep of Kansas. In Lubbock, Texas Tech also collected a sweep of visiting TCU. Middle blocker Shelly Fanning was the star for the Bears. Fanning converted 18/26 attacks, good for a .692 clip. Outside hitter Yossiana Pressley tallied 9 kills, but only hit .088. Fellow Baylor Middle blocker Jaelyn Jackson found great success in the middle as she converted 5/6 of attacks (.833). Kansas got 13 kills from outside hitter Ashley Smith and 12 from fellow outside hitter Jada Burse. After starting Big 12 play 6-0, the Jayhawks have now dropped three straight matches. Baylor hit .296 for the match and held Kansas to .178. The first set went back and forth, but it was Baylor who seized control midway through the set. With an 11-10 lead, the Bears reeled off six straight to take a 17-10 lead. Kansas battled back and used a pair of 4-0 runs to cut the deficit to 24-21, but Baylor got a kill from outside hitter Yossiana Pressley to take the opener, 25-21. Baylor led for most of the second set, but Kansas managed to keep it close. The Jayhawks took the lead at 12-11 before a 4-1 spurt gave the Bears a 15-13 advantage. Kansas continued to battle, tying the set at 20. From there, Baylor closed out the set on a 5-1 run, to take the set, 25-21. The Bears trailed 3-2 early in the third set, but a 7-2 run gave Baylor a 9-5 lead and put them in control for the remainder of the match. Baylor would extend its lead and complete the sweep of the Jayhawks with a 25-17 victory. The Red Raiders were led by outside hitter Brooke Kanas, who finished with 13 kills. Fellow outside hitter Emily Hill added 12 kills and 11 digs. TCU outside hitter Lexi MacLean led the way with 12 kills. Texas Tech hit .282 as a team and limited TCU to .155. The Longhorns got a match-high 13 kills from outside hitter Micaya White. Texas also got 10 kills from outside hitter Logan Eggleston. The Sooners were led by outside hitter Alyssa Enneking, who tallied 12 kills. Outside hitter Morgan Miller chipped in 9 kills for Oklahoma. Texas hit .309 for the match and held Oklahoma to .208. Both teams were a sloppy from the service line. Oklahoma committed 13 service errors and converted just one ace while Texas committed 6, but converted 4 aces. (RV) Baylor heads to Norman to take on Oklahoma at 8 p.m. ET Saturday. (RV) Kansas visits West Virginia at 6 p.m. ET Wednesday. Texas Tech hits the road to battle (RV) Kansas Saturday. Match time has yet to be announced. #9 Texas hosts TCU at 8 p.m. ET Wednesday.